Let prisoners donate organs: It could be fair, ethical, and just. Let prisoners donate organs. It could be done ethically and serve justice. 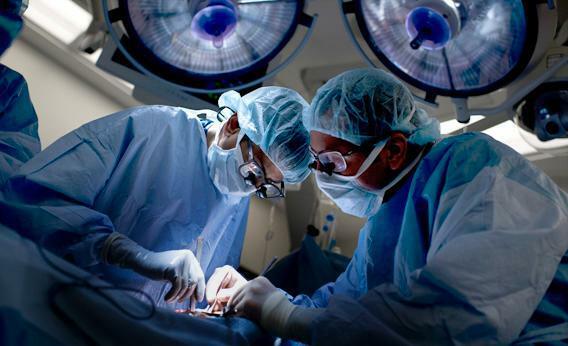 Dr. Niraj Desai sews in a kidney to a recipient patient during a kidney transplant at Johns Hopkins Hospital June 26, 2012, in Baltimore. Last month, the Senate Health, Education, Labor and Pensions Committee made life a little better for people awaiting an organ transplant. It passed the HIV Organ Policy Equity (HOPE) Act, legislation designed to end the federal ban on research into organ donations from deceased HIV-positive donors to HIV-positive recipients. It would permit the Secretary of Health and Human Services to sanction such transplant operations if the research establishes their safety. “Those infected with HIV are now living much longer and, as a consequence, are suffering more kidney and liver failure,” said Sen. Tom Coburn, a physician and one of the bill’s co-sponsors. Advocates of the legislation, which has bipartisan support in the House, estimate that organs from deceased HIV-positive donors could each year save about 1,000 HIV-infected patients who suffer from liver and kidney failure. The future beneficiaries of HOPE aren’t just the patients desperate for a new kidney, liver, or heart. The donors also benefit; they see value in leaving their organs to medicine. Giving the “gift of life,” the narrative long championed by the transplant community to encourage people to become donors, is an opportunity to perform the ultimate charitable act—saving the life of another. Through posthumous donation, some people see the chance to fulfill a moral obligation to help others or to make something life-affirming come from their death. Another marked population—prison inmates—is also pushing to expand its opportunity to save lives. Last month, Utah state legislator Steve Eliason proposed a bill allowing prisoners to sign up to become donors if their death occurs while incarcerated. Although there is currently no nationwide legal proscription against prisoners signing up to become posthumous donors, Eliason wanted the allowance enshrined in statute. “There are many inmates who are constantly looking to give back to society in any way they can,” said Steven Gehrke of the Utah Department of Corrections, which supports Eliason’s effort. “They feel like sitting in prison doesn’t really repay their debts.” At least three other states—Arizona, Texas, and California—promote deceased donation among inmates. But what about inmates who want to donate while they are still alive? Ross wanted to donate one of his kidneys to a stranger. And he wanted to do it now, given the odds that his organs would no longer be usable after he died. Ross had done his homework. He pointed out that a patient who receives a kidney from a live donor instead of a cadaver can expect the organ to last several years longer. He knew that the operation he would undergo involved the surgeon making a few keyhole-size incisions in the abdomen and that the hospital stay is usually two days. Ross said this was not a decision he made lightly—surgery is not a trivial event—but stressed that he would want to donate even if the recovery period were more prolonged. The barrier was the penal system. “As a rule, we are banned from live organ donation (even though an inmate in need of an organ is given equal priority on the waiting list as everyone else),” Ross wrote me some months later. Wisconsin’s department of corrections is not alone in imposing such a ban on prisoners; I have not been able to find any states that permit inmates to give a kidney to a stranger. This stance mirrors the policy of the Federal Bureau of Prisons, which forbids federal inmates to donate to a stranger. The Bureau does, however, allow live organ and bone marrow donation by federal inmates when the recipient is a parent, sibling, or biological child. In my view, there is no compelling reason to bar all inmates, as a matter of policy, from making live donations to strangers. Bioethicists may contend that it is not ethical to allow prisoners to donate because incarceration is a coercive process that limits one’s freedom to make a choice, but there are ways to make inmate donation safe and fair. For example, authorities would stipulate that the donation could not have bearing on parole, and the donor would be made fully aware that relinquishing an organ would do nothing to secure early release. What’s more, a prospective donor would undergo rigorous informed consent regarding surgery and the risks of living with one kidney, as is required for any kidney donor. Medical and psychological testing would be performed, which is also standard. A several-month “cooling off” period before surgery should be a good gauge of an inmate’s commitment to donate. Likewise, review by a prison-appointed panel could determine the authenticity of his request as well as a test of whether his expectations are realistic. Annual medical checkups following transplant could be paid through a Medicaid voucher (which is not even a regular feature of standard donation on “the outside”). Hepatitis and HIV occur at relatively high rates in the prison population, posing a risk of transmitting the diseases to non-infected recipients. But the solution is to test the inmate at initial screening—the standard procedure for any living donor—and then again at three weeks prior to surgery. He should be kept in medical isolation between the final test and the transplant date so he can’t become infected and pass on a newly acquired virus before it can be detected. This strategy would provide as much, if not more, confidence in the safety of the transplant as is the case for standard transplants. Compare this to the procedure surrounding unplanned, deceased donors—often victims of gunshot wounds or car accidents—where there is pressure to obtain test results quickly, to rely on family members for donors’ health information, and to perform the transplant before the removed cadaver organ becomes damaged from sitting “on ice” too long.